Love these curtains. They are light colored and bright, yet dark enough to block the sun. Add a touch of whimsy to your space with this Lush Decor Rowley curtain panel pair. Each panel is crafted from polyester with a rod pocket header for easy mounting, and is machine washable for easy care. 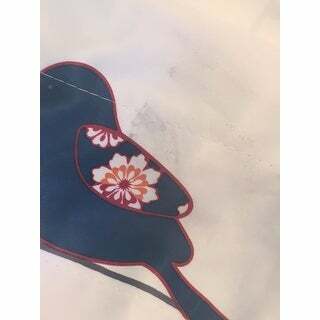 The panels feature lines of multi-pattern birds on vines, available in a variety of trendy colors and set over an off-white background for a lovely look that will beautifully filter the light. Dimensions 3.0 In. X 11.0 In. X 12.0 In. 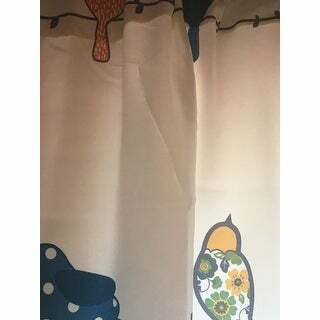 The curtains were cute however the top had a black mark and there were scratches on the fabric all over both panels. It looks like wrinkles in the pictures but the fabric is actually scratched/torn. Great thick fabric. The blush is more peach than expected. I did return mine because their was what appeared to be pizza sauce on one of the panels, and they didn't slide open as quickly as I wanted. I put the old panels back up because I realized I was use the ease of the grommets on my old panels. I would recommend these panels though. Good quality, just not quite what I wanted. 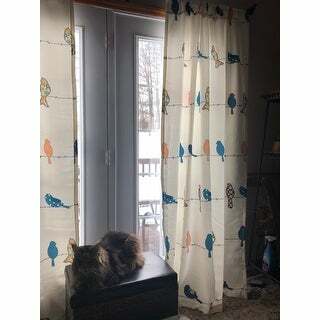 I absolutely love these bird curtains! I had been looking for cute curtains for my kitchen window. The colors are perfect! They are so cute! I went with the teal like blue and gray birds to match our decor. They are a soft material and they are the perfect length. I love that they can go on a rod or hang from clips. We hung ours from clips, so that they could be opened easily. We have had lots of compliments on them as well. 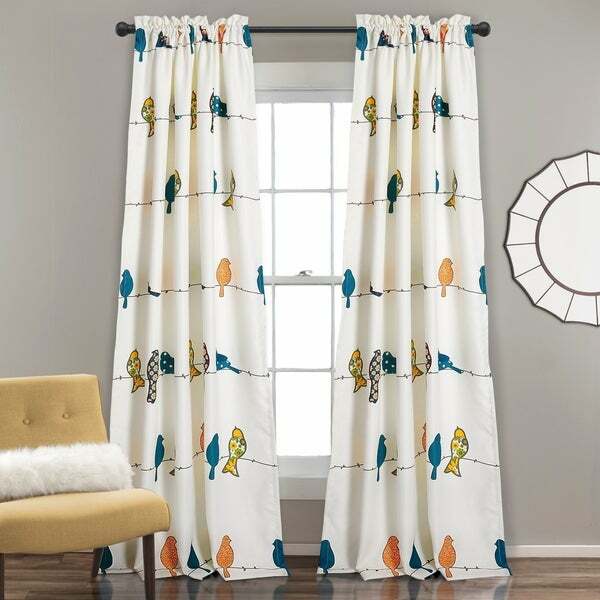 These curtains caught my eye on the website as they contained the multi-colors I was looking for and the birds seemed to give them that touch of whimsy that made me smile. In person, these curtains are so much more luxurious and stunning than the pictures could ever reflect. Once hung in three different windows across my living/family room areas, the entire space was immediately brightened and transformed. It is rare to get both the sophistication/elegance and whimsy in one product design, but these definitely achieved both. These Rowley Birds panels are adorable. They arrived quickly in perfect shape - I didn't even have to iron out any wrinkles. The quality of the fabric is great - they are a heavy weight and have a nice smooth texture. Colors are exactly as shown. I would not call them room darkening and would not recommend them for that purpose. For me, they are just what I wanted and are a great accent in my bedroom. 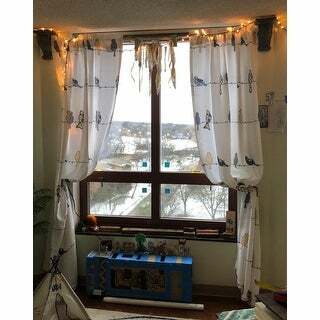 These are very nice curtains that are bright white and the birds are very cute. I didn't have any discrepancies in the pattern or with the material. They do let a little light through the fabric, but I have blinds on the same windows, which help block out all the light. I'm in love with these lush curtains....perfect for the new Spring look after a long winter. They really brighten up the room. Love all the wonderful colors. They look awesome with my bird collection. I love the cheerful colors in these curtains. While they say they are light filtering they are actually a nice weight and hang beautifully. 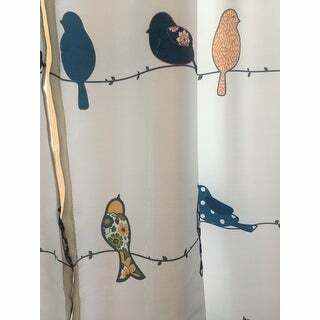 Love these bird drapes.they come in tso color combinations;turquoise blue and orange birds or yellow and grey bird . The drapes are heavy . Easy to wash . Can put them in the dryer and they dont need ironing.before hanging back up. These are adorable and very well made. They are nice and thick but I am giving four stars only because in my previous bedroom, with a southern exposure, they were not able to block out all of the light--but some (combined with a window shade). Maybe that's why they're called light filtering and not light blocking. But they are really super charming! I bought these for a guest room and they are very cute. The material was silkier than I expected. My daughter said they looked like a shower curtain and they do have that look but they are really cute and I’m keeping them. Love these curtains, fabric is beautifully silky, vivid colors, super cute. Have been looking for something like this for a while. Wrinkles quickly came out after a toss in the dryer. The quality of these curtains is outstanding. They are very soft like microfiber. Stitching is all intact. The colors are very true to what is represented on Overstock. 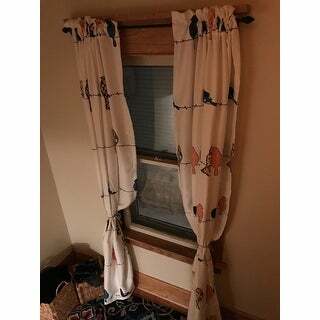 The price was better than several other sites that had the same curtains. I love these curtains but I wouldn’t rely on them to darken the room completely. The fabric is very soft with a slight sheen. It feels very high quality! The colors are bright and happy. I am very pleased that I bought these curtains! I love these curtains so much I have them in two bedrooms. They help with room darkening as stated, but they are cheerful and fun and look nice with my handmade quilts. I loved these curtains....however, I needed to return only because they just didn’t go with the room. I love these curtains. They add a pop of color but not overbearing and are a great quality material. I love their whimsy because they make me smile I decorate modern farmhouse style and these fit perfectly into the style. Love the quality of these curtains and the colors are just right for my master bedroom. They go perfectly with the Kichler Steeplechase light pendant (also purchased on Overstock). SO bright, I love them. I am moving! what a great addition! Love ‘em! The pattern is beautiful, and certainly not commonplace. Interestingly, the birds are all showing their backside... which only means they’re looking outside. I like naming them and making up stories about them. They were clearly described as nylon, but being a guy, that means very little...i hate nylon. But, it’s not like i have to wear them as an undershirt. Very scratchy to feel, beautiful to look at. I just wont touch. Definitely will recommend to everyone. I absolutely love this! IT's exactly what I expected! It is so gorgeous! "Is each panel 54" wide or both panels together?" "The blue choice looks like a pale aqua, which is what I am looking for. Is it a true blue, or slightly aqua?" Yes, I believe it’s just the color you are looking for. The birds are a light teal, just like pictured. "Are these black out curtain or opaque? They have been mentioned as both." They are not a full 100% black-out curtain - a little light does filter through. Probably more like a 75-85% black-out. I have these hanging on a west-facing window and in the afternoon it is BRIGHT in that room. Definitely not black-out. They are thick and heavy and very lovely, but if you are trying to keep the sun out, these are not the curtains. "do you have aqua color Bird curtains available?" This is currently only in stock in the multi option. Do you know when the aqua will be in stock? "Is the background an off white or is it white?" It is not a pure white. It is just a slight off white background. Works with our lime colored walls. My husband liked it too. I love the birds an the fact that they will block sunlight as I need it. "Are the birds gray or navy? In some pictures they are grey, and in other pictures they are navy." The birds are blue. There are two shades of blue and one is close to navy , and one is a little lighter. I love these curtains I have four (two pairs) that span a bay window. I had the same issue when I was ordering them. If the color is listed as "multi-color" then the birds are a mix of teal, orange, and greens. Truly stunning.